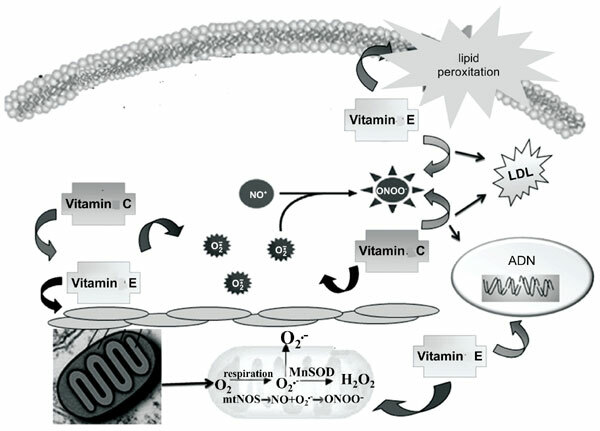 Objective: The oxidative process in atherogenesis generated by proinflammatory induction and response to antioxidants vitamins in an experimental model were analyzed. Methods: Male rats were used: (A)Control, (B)Control+vitamin E plus C, (C)Hyperfibrinogenemia and (D)Hyperfibrinogenemia+vitamins E plus C. Hyperfibrinogenemia induced by daily injection of adrenaline (0.1mg/day/rat) for 120 days. Treatment: 3.42 mg/kg of vitamin E plus 2.14 mg/kg of vitamin C, fifteen days after induction. Vascular histology analyzed by optical microscopy. Fibrinogen, nitrites and superoxide dismutase analyzed by spectrophotometry. Statistics: MANOVA, Hotelling test for post testing, significance level p<0.05. Results: (C) group showed higher fibrinogen than (A) and (B)(p<0.001). Compared to (C) group, (D) showed a decrease of fibrinogen (p<0.001). A marked increase in nitrites was found in (C) versus (A), (B) and (D) groups (p<0.001). Superoxide dismutase activity increased in (C) group compared to groups (A) and (B) (p<0.001). In the group (D) an increase of the activity of this enzyme was observed in comparison to groups (C)(p<0.001), (A) and (B) (p<0.0001 in both). The (C) group shown endothelial denudation, thickening of the vascular intima and extracellular matrix enlargement with foam cells(p<0.001). Conclusion: These results strongly suggest that vitamins E plus C produce regression of inflammatory and oxidative stress processes in this experimental model. Keywords: Antioxidants, atherogenesis, atherosclerosis, hyperfibrinogenemia, oxidative stress, vitamins E plus C.
Keywords:Antioxidants, atherogenesis, atherosclerosis, hyperfibrinogenemia, oxidative stress, vitamins E plus C.
Abstract:Objective: The oxidative process in atherogenesis generated by proinflammatory induction and response to antioxidants vitamins in an experimental model were analyzed. Pandemic of Atopic Diseases - A Lack of Microbial Exposure in Early Infancy?